The NAMM Show 2018 will likely be remembered as one of the best in recent years for new pedals as the sheer quality and quantity of standout releases made this year’s show really something special. Several well-known and up-and-coming builders are pushing the limits of what musicians previously thought was possible from boxes of components, knobs, switches, and… buttons. While all of us at BGE have respect for all the great builders in this industry and the great work they do, the aim of this article is to shine a light on the few pedals that stand out above the rest with special attention paid to pedals offering new sounds and innovations to guitarists and other effects loving musicians. Zoia Horn was a librarian and intellectual freedom fighter who believed that the right to privacy and freedom of thought should take precedence over big government motions to spy on citizens and strip away freedoms. She was once jailed for refusing to testify in court as a matter of conscience. Zoia encouraged non-compliance with the heinously named Patriot Act and even opposed library fees, citing them as “barriers to information access”. Zoia Horn was a revolutionary, an Empress whose life’s work was to herald the advent of a world where human potential could flourish without the sin of restriction. The Empress Effects Zoia pedal is a bastion of creative freedom that (when released) will contain a treasure trove of well over 50 effects modules that can be linked together in simple or complex combinations. It’s like the equivalent of a massive modular pedalboard or DIY multi-effect in a single pedal. It brings the myriad sound design possibilities of software like Pure Data or Max/MSP to guitarists in a pedal format, unrestrained by keyboard, mouse, and desktop computer. Those unfamiliar with such platforms may find it difficult to fully grasp what the Zoia is without experiencing it firsthand, but the idea is to give musicians the power to create any effect(s) they can dream up. The Zoia is at once a sandbox and universe of creative potential. Imagine stringing together a whole chain of different effects and recalling an entire signal chain at will. Now imagine tempo-synced LFOs, ADSR envelopes, and/or envelope followers routed to modulate various parameters throughout your signal chain. Imagine sending LFOs as MIDI CCs to control other pedals. Imagine re-wiring the inputs and outputs for stereo I/O or pre/post signal routing. Imagine custom granular synthesis, FM synths, all kinds of other obscure effects, Empress Echosystem/Reverb style delay/reverb combinations, and more effect combo possibilities than you could possibly imagine until you start digging in. The Zoia undoubtedly represents one of the boldest leaps forward in guitar pedals in recent years. The Zoia is for musicians who want to venture into uncharted territories by becoming the sound designers of their own effects. Start with a drive type. Then add a Tone or EQ section. Maybe go back and link a compressor on the front end. What about an octaver effect? Maybe have an envelope follower modulate the drive amount in real-time as you play. I had a crazy idea for a reverb with both high-pass and low-pass filters on the wet signal. In a couple minutes I was hearing these sounds at NAMM. Then for fun, assigning an envelope follower to have the input signal modulate the filters created a sound with some strange sitar-like resonance. Lots of calculated sound creation and happy accidents will be found in the Zoia. Users will be able to share and trade their complex preset creations, and Empress will be continuously expanding the Zoia with more modules and features. The version of Zoia at NAMM offered only a hint of what kinds of possibilities will be in store. When the Zoia is released, musicians will be liberated from the closed-ended guitar effects pedals that came before. If you just want to plug-in and play, the Zoia may not be for you. But if you want to create all-new sounds or the obscure effects you’ve been dreaming of for years, the Zoia may be the last pedal you ever need. In development since 2011, the WMD Geiger Counter Pro was unveiled way back at Winter NAMM 2015, then shown again at Winter NAMM 2016… and Winter NAMM 2017. This is the 4th year Best Guitar Effects has featured this pedal in our Best Pedals of NAMM roundup. But guess what? They’re being built now, and it’s finally coming out in February 2018. The GC Pro is a digital wavetable bit-crushing distortion pedal that packs in 512 wavetables for an incredibly wide range of distortion textures. It contains all of the 256 wavetables from the original Geiger Counter with an additional 256 all new wavetables. A new “Morph” mode allows you to smoothly blend wavetables for further texture sculpting, perhaps my favorite tonal feature of the new pedal. The GC Pro also has 16 onboard presets which can be selected from the pedal or via MIDI. There are 2 CV inputs which can be assigned to various parameters. All parameters are MIDI controllable. WMD is also releasing the Geiger Counter Pro VST which you can load in your DAW of choice as a plugin to take full control of the pedal from the pedal. I’m already imagining the possibilities of what could be done pairing this pedal with Ableton Live 10. The Geiger Counter Pro will be one of the most original and unique distortion pedals to be released in years. One more thing… There will also be 50 limited edition black units sold directly through the WMD website, so you might want to get in on that if you vibe with the alternate paint-job. Guitar effects have come a long way since reel-to-reel tape decks were first used in creative ways to produce slapback echoes, double-tracking, and flanging among other effects, and the introduction of bucket brigade device (BBD) delay chips ushered in a new wave of effects, replicating the delay, chorus, and flanging effects previously achievable only through far more cumbersome and costly means. While everything from mechanical springs to light-bulbs has been employed to create new analog effects and sounds, there really haven’t been many breakthroughs in recent years that have yielded new types of analog effects using existing or new technologies. Well, the Thermae was one of the surprise pedals at NAMM with new tricks up its sleeve. Chase Bliss Audio has become one of the leading innovators in analog effects, using digital means to precisely control all parameters affecting 100% all-analog signal paths. This approach has brought guitarists presets, MIDI, and among other features, parameter “Ramping”, that add to the uniqueness of the builder’s interpretation of classic analog effects. Now the Chase Bliss Audio Thermae Analog Delay / Pitch Shifter is bringing something new to the world of analog guitar effects pedals: pitch-shifting delay. Pitch-shifting to specific intervals was first pioneered over 4 decades ago in the Eventide H910 Harmonizer and lives on today in their H9 Harmonizer. Other companies brought the concept to pedals first as seen in the early Boss PS-2 & PS-3. But these effects are all digital. While BBD based analog delay pedals can do pitch-shifty sounds by adjusting tempo and/or tap intervals, the Thermae has been engineered to shift pitch to precise intervals from -2 octaves to +2 octaves with various 4ths & 5ths in between. It’s fascinating to note which pitches that engineer, Joel Korte, chose to make available. My initial assumption was that octaves and perfect 4ths & 5ths might have simply been a matter of mathematical convenience when implementing digital control over the analog components. But really it was a matter of practical selection of the most musical note intervals that would sound pleasing in more free-form jam scenarios. After all, had the Thermae included major and minor 3rds, using these intervals would require a bit more thought rather than just letting the pedal create harmonies to your playing in more serendipitously musical ways. One last point of note is that the Thermae shouldn’t be considered a 1:1 replacement to the Tonal Recall RKM despite its super long delay times and normal delay mode. The modulation is a bit different, and the Thermae’s LPF provides a more resonant filtering compared to the Tonal Recall’s smoother high-end roll-off. The Thermae is more of a novel and exploratory effect for guitarists looking for something a little different, but it certainly offers an experience unlike anything else that’s come before. The Red Panda Tensor was first revealed at Winter NAMM 2017, and then I said that it looks like “the most exciting Red Panda pedal since the Particle”. Red Panda is known for making wild sound-mangling pedals, and the Tensor is arguably their most insane release yet. The Tensor can stretch your playing up to 4:1, pitch-shift from -2 to +2 octaves, do tape stop effects, and all kinds of weird forwards, backwards, and alternating looping craziness with time compression from 1:4 to 4:1. A secret I heard a year ago was that the Tensor might even add MIDI for taking full control of the pedal’s functions, and the Tensor does offer MIDI over USB. Parameters can also be assigned to the expression/CV port for further control. The Tensor is again one of the best pedals of NAMM and looks like it’ll be yet another excellent release from Red Panda. Electro Harmonix pretty much invented the concept of the looping pedal back in 1982 with their 16-Second Digital Delay, and they’ve maintained a looping presence over the years with with a reissue of the classic unit along with the more recent 360, 720, and 22500 pedals and their flagship 45000 Multi-Track Looping Recorder. Even the smash-hit Canyon Delay & Looper draws on EHX’s legacy in looping with a dedicated Looper mode. But the Electro Harmonix 95000 Performance Loop Laboratory is arguably the most ambitious looping pedal ever conceived. Optimized for table-top and floor usage, the 95000 boasts a massive 6 pannable mono tracks and a stereo mixdown track, a number which you can double by connecting another unit with a standard MIDI cable for the ultimate loop laboratory. The connectivity possibilities are vast with stereo I/O, Mic Inputs with phantom power, MIDI I/O, USB jack, memory card slot, and more. The tempo can be adjusted in ½ step intervals or smoothly for pitch-warping and tape-stop effects. The 95000 also boasts full MIDI implementation over its functions meaning you could customize an external MIDI controller to take over full operation of the unit. You can also synchronize the 95000 to MIDI Clock, and its looping functions can quantize to the beat for precision looping which is a pretty dig deal if you plan to synchronize the 95000 to external hardware. This barely scratches the surface of what the EHX 95000 offers, but looping artists will be doing some incredible things with this unit in the years to come. I never thought I would be excited about a graphic EQ pedal, but I got to spend some time with both of Free The Tone’s new Programmable Analog 10-Band EQ pedals, the PA-1QG (for guitar) and the PA-1QB (for bass) before The NAMM Show, and my expectations were greatly exceeded. I expected that they would sound excellent given Free The Tone’s reputation for crafting pro gear for discerning musicians, and sure enough they do. With a flat response, they’re incredibly transparent when active or bypassed thanks to Free The Tone’s refined HTS (Holistic Tonal Solution) circuitry. The EQ frequency bands chosen on the guitar version (PA-1QG) have been excellent so far for sculpting tones. I haven’t had a chance to plug in my bass yet (because NAMM and NAMMthrax), but the PA-1QB also may be well-suited to extended range guitars if my initial impressions are any indication. The pedals are incredibly easy to use, and I was tweaking, saving, and recalling presets before I even read the manual. The biggest draw of these pedals may be the MIDI implementation for recalling presets; when using the pedal(s) with an effects switcher, you can recall a preset that perfectly contours your tone for any combination of other effects you’re using. Pending our in-depth review, these are likely the best dedicated pedal based EQ pedals guitarists and bassists are likely to find. The Alexander Pedals Colour Theory Spectrum Sequencer is another forward thinking pedal that offers musicians new sounds and ways to approach using guitar pedals. It’s essentially an 8-step sequencer that has 6 modes: Pitch, Mod, Filter, Tremolo, Oscillator, & PWM (synthesized octave). You can tap in a tempo for the sequencer or alternate between manual scrolling through taps. The 4 parameters for each mode can be sequenced, and you can also use an external app like TouchOSC for easier programming and creation of up to 16 onboard presets. The Colour Theory also has full MIDI implementation for external control from an effects switcher or other MIDI source (again, like the TouchOSC app). You can also use the Colour Theory as a sequencer to control parameters on other pedals via their EXP/CV ports. Very cool. Lots of inspiration abounds in this little box. But… the sounds, the sounds! When I heard about the Colour Theory before NAMM, Alexander Pedals was originally going to have only 4 modes, and they were considering scrapping one for another mode. But instead they decided to go all-in, keeping the 5 modes and adding a 6th mode: the PWM setting which does some pretty killer monophonic squared synth sounds. While all the sweet sequencing fun is what the Colour Theory is centered around, the option to manually step through a sequence makes things even more interesting. You could have one preset containing 8 different sounds, easily accessible by scrolling with the Tap foot-switch or by selecting sounds directly from a MIDI effects switcher. This is going to be one incredibly versatile pedal and a sign that Alexander Pedals is really pushing the Neo Series into uncharted territories. Chase Bliss Audio delivered a one-two punch at NAMM with the showing of two epic new pedals. The Condor is the builder’s take on an all-in-one EQ/Preamp/Filter pedal that offers many unique possibilities outside of what those individual types of effects may have achieved separately. There’s a low-end sculpting Bass control with a dedicated switch that adjusts its shelving range. Then there’s a Mids section that can boost or cut mids across a wide frequency spectrum (150Hz – 5kHz) dialed in with a dedicated Frequency control; the Q can also be adjusted for more precise or broad mids contouring. Then there’s a LPF control that can roll off the highs or be used for filter sweeps with 3 settings for the cutoff resonance. There are also clean and overdrive modes in case you’d like to use the Condor as a dedicated overdrive pedal. The Condor initially seems like more of a creative tonal sculpting tool than a master of EQ or dedicated filtering pedal. While I would love to have seen the Condor released as two birds: an “EQ version” with Bass & Treble shelving/boosting/cutting and a “Filter version” with LPF and HPF (with both versions retaining similar Mids filtering & boost/cut functionality), the single pedal released looks like it will yield some solid general low/mid EQ-ing with high end roll-off and some cool creative filtering and tonal coloring effects along with some really funky filter modulation thanks to Chase Bliss Audio’s signature ramping effects. (High shelving can still be achieve through subtractive EQing by lowering the Bass & Mids and raising the output volume.) I will say that as far as going in a different direction from other dedicated EQ and Filter pedals, the current configuration of the Condor does still seem like a pretty standout candidate for shaping the sound of other pedals (particularly dirt) from a position later in your signal chain. Typically, a bit high-end rolloff and bass boost or cut is all that’s needed. The super flexible Mids section is another huge bonus. The Condor can also do tremolo sounds, phasing-like modulation, and auto-filtering. Having MIDI, presets, expression control, and all the usual CBA bells and whistles makes this bird even more enticing. The Gamechanger Audio Plasma Pedal already commanded our attention before NAMM with its flux capacitor meets Tesla coil inspired light show courtesy of a xenon-filled tube, but it turns out that the prototype pedals at NAMM sounded pretty good, too. Pushing up the Blend control mixes in a unique style of distortion that is rich in harmonic coloration and fuzzy texture. The Voltage controls the intensity of the distortion. At lower settings it’ll starve out the signal, making it very responsive to staccato playing, and at higher settings the electrified distortion is more prominent. The xenon-filled tube always provides a visual indication of the distortion for a synesthetic effect. There are also familiar tone controls and a Drive parameter, but the pedal may undergo a few more tweaks and design revisions before its release later this year. In any case the Plasma Pedal is another strong showing from Gamechanger Audio and is certainly a pedal to keep your eyes on. The new Rainger FX Reverb-X is a digital reverb in a similar format to their previously released Echo-X delay (which was also back at NAMM with a new graphic look). The Reverb-X is a digital reverb with up to 6 seconds of decay time. Optional distortion lets you make it dirty for shoegaze style reverb excursions. There’s also an awesome Gate function that lets the huge reverb be heard while you’re playing; the Igor foot-controller comes in handy for activating the effect at will. The pedal is ultra-compact with all the jacks top-mounted on its tiny enclosure, so it’ll be an easy fit on any pedalboard. And seriously, it can’t be stated enough how cool this pedal sounds. Mr. David Rainger managed to put a lot of mojo in this thing. Killer all-around vibe presented at NAMM, so creative guitarists will want to check it out. First off, the Neunaber XD-1 Experimental Drive Prototype is not a pedal that will be released in its current form. As stated by Neunaber, it is a “proof of concept submitted for your evaluation”. It’s essentially an example of the direction Neunaber may head in with the release of their inevitable drive pedal. The goal was to create a drive pedal that could respond well on any setting in a musical, amp-like manner while not sounding overly compressed. I spent some time with it at NAMM and was wowed by the Red channel. It had a nice big heavy sound and was incredibly responsive, arguably some of the best heavy tones I’ve heard from a pedal. The Tone control on the unit was a tilt EQ that lowers the bass as the treble is boosted and vice versa. It’s not my personal favorite style of EQ, but it worked well enough for the prototype unit, and the Mid knob did a solid job of cutting and boosting the midrange. But most impressive was the amp-like sound of the distortion, a quality which may also be due to the unit being paired with the Iconoclast, a speaker emulator that already has a nice speaker cabinet style “sag” which contributes to the amp-like feel. But the distortion was simply awesome throughout the range of the Red Gain knob. The Blue channel was a decent low to mid gain affair, but I’d like to see it spruced up for the actual release. The upper range of the Blue Gain could use a little refinement as the channel transitions from clean to breakup. It was confirmed by Mr. Brian Neunaber that more development time had been put into the Red channel before NAMM. It’s likely that a release version of this concept will be up to full Neunaber spec and be even more impressive than the iteration show at NAMM. But I’d happily enjoy the Red channel as-is, a testament to how good it was in the prototype unit. This pedal is one update that deserves mentioning because it solves the main issue of its previous iteration. The original Waveformer Destroyer is a badass monster of a fuzz & distortion unit with 4 foot-swiches to select various sounds and a Master volume control. 8 internal dip-switches let you customize the various distortion sounds available. This is a solid approach for creating a set of preset sounds to use when performing, but it isn’t as conducive to spontaneous creativity since you can’t easily access all the available sounds. The Death By Audio Waveformer Destroyer MK2 takes the 8 internal dip-switch functions and assigns them to external flip-switches. This makes the pedal extra huge, which may not be cool if you’re using a small board, but this makes the pedal super fun for easily trying out new sounds. As a studio tool, the Waveformer Destroyer MK2 could provide a ton of flexibility for layering different textures quickly. Or if you’re using a modular setup, you could run beats and synths into the pedal and more easily find rad distortion sounds to mangle your audio signals. This pedal will also be a limited run as they’re pretty complicated to assemble, so you might want to keep an eye on the Death By Audio website to pre-order. The Epigaze Audio Ascension Reverb was on display at Summer NAMM 2017 and was one of the best pedals of the show. It was back again at Winter NAMM 2018 in anticipation of a Spring release and is still one of the most hotly anticipated pedals we’re looking forward to. The Ascension Reverb has 3 modes: Hall, Modulated Hall (with tremolo), and Shimmer. There’s also a droning self-generated pad that can be tuned to any of the 12 keys of western music. A side-mounted knob allows the Pad to be faded in and out. There’s also a Send and Return loop for adding other pedals into the wash of reverb. This heavenly reverb pedal will likely be very popular among fans of ambient guitar textures and pretty much a hit with anyone who appreciates beautiful reverb tones. Keeley Electronics is a legend when it comes to guitar compressor pedals, and their consistently stellar overdrive releases and drive mods over the years show proven expertise in that area as well. 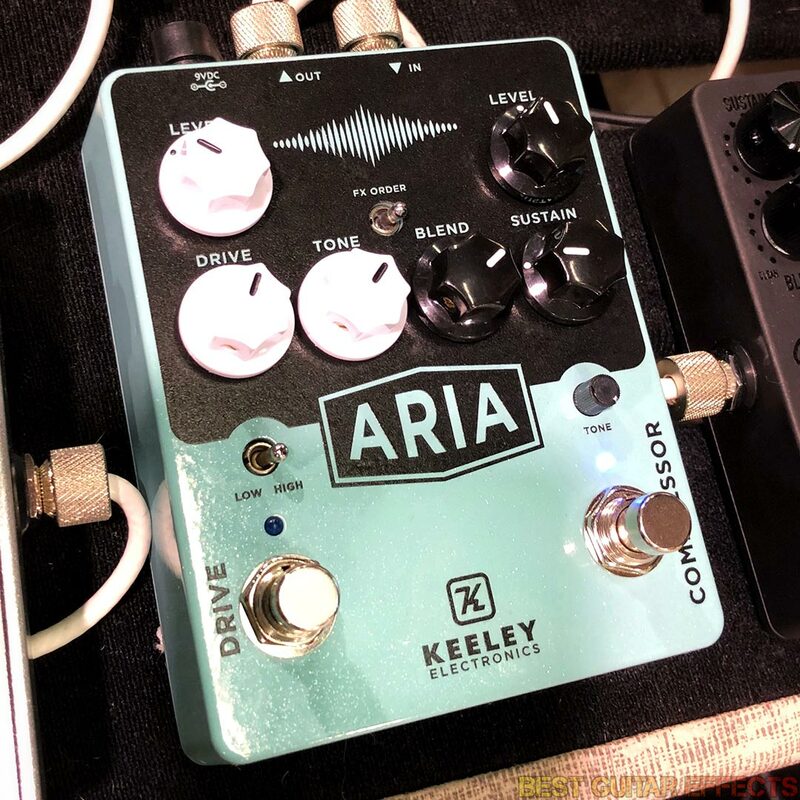 Now hot on the heels of the success of their D&M Drive pedal comes the Keeley Electronics Aria Compressor / Drive. In a similar combo enclosure to the D&M Drive and Caverns V2, the Aria gives guitarists a Keeley Compressor Plus and an all-new Keeley take on the Tube Screamer style circuit with Low and High gain modes. While TS mods are a dime a dozen, Keeley has found more ways to reinvent this circuit than any other esteemed builder, so the Aria will definitely we worth looking into if you’re a fan of TS flavors of drive. Also, the Compressor Plus side retains a full parameter set from the original pedal including an internal Single Coil / Humbucker switch. The TRS signal routing from the D&M Drive is also present for pro guitarists who want to route the 2 circuits to different loops on an effects switcher. The Aria will definitely be worth a look when it drops and will likely be yet another sleeper hit from Keeley Electronics. The Beetronics Royal Jelly is a blendable fuzz/overdrive pedal made in collaboration with veteran pedal designer, Howard Davis. The Royal Jelly lets select between 2 preset settings of fuzz and overdrive. You can set either preset (labeled Queen & King) to be only fuzz or overdrive or any ratio of each. The Buzz foot-switch lets you add a stinging bite to the fuzz for a more aggressive sound akin to some vintage fuzz pedals. There are Hi and Lo tone controls as well as a Blend which lets you mix in your dry signal, particularly useful for refining bass tones or when stacking the pedal with other distortion pedals or a hot amp. Beetronics had a neat demo station at NAMM which let you adjust knob settings while a pre-recorded guitar track was fed into the pedal, but considering all the mojo in this thing, the Royal Jelly is a pedal best experienced and played firsthand. In the vein of their hit Muffuletta that offered a plethora of cloned Big Muff circuits, the JHS Pedals Bonsai replicates 9 different variations of Tube Screamer style overdrive sounds. JHS went to great lengths to recreate the sounds of several classic pedals as well as offering a few other variants. The modes include sounds of the Boss OD-1 Over Drive, an Ibanez TS-808 Tube Screamer from 1979, an Ibanez TS9 from 1982, an Ibanez Metal Screamer from 1985, an Ibanez TS-10 from 1986, an Exar OD1 Overdrive from 1989, the Hot mode of an Ibanez TS7 from 1999, the Keeley Mod Plus TS-808 mod from 2002, and JHS’s TS9 Strong Mod. The Bonsai looks like a Swiss Army Knife of great Tube Screamer tones that will satisfy any guitarist who can’t get enough of those classic sounds. The Malekko Downer is another rad looking pedal released on the same DSP platform as the Charlie Foxtrot and Scrutator. It’s a wave-folding, saturating, octave filtering noise machine. It can do pretty basic distortion stuff if you want it to, but blending in the other effects is where things get really interesting. It can do cool warped pitch effects and general octave stuff as well as high/low pass filtering, trem-like effects, and almost ring-mod like sounds. This is another cool and edgy pedal from Malekko that will appeal to guitarists looking for less traditional sounds and more inspiring textures. The original Pigtronix Mothership Analog Guitar Synthesizer was noteworthy for its crazy 100% analog synth sounds and also for having a ring mod section that tracked the pitch of the input signal. When Pigtronix dropped the long-awaited Mothership 2 Analog Synthesizer, they focused on shrinking all the synth functions, but the ring mod effects were notably absent. Well, they’re back and expanded upon in the new Pigtronix Ringmaster Analog Multiplier. The Ringmaster is essentially a ring modulator that is also capable of producing tremolo effects. The big draw of the pedal and what separates it from other analog ring mod pedals is its ability to track your input signal to maintain consistency of the ring mod effect while you play. If you’re going for tremolo effects, you can also change the speed of the trem in relation to the frequency of the notes you play; higher pitches yield faster speeds while lower pitches produce slower speeds. You can also do random Sample + Hold effects. For modular gear fans, the Ringmaster also has a Modulation CV output as well as External Carrier Input and Internal Carrier Output options. The Ringmaster looks like it would make an excellent companion to the Mothership 2, and I know fans of that pedal are already giving the Ringmaster a good hard look. Time to get F.A.T.’er. There were a few awesome envelope filter pedals at NAMM, but the Death By Audio Deep Animation was the one that stood out the most for me. The Deep Animation is one of the thicker and heavier envelope filters I’ve heard. It’ll do all that quacky, funky, auto-wah guitar stuff you’re used to, but it has a lot more potential than that. The 6-position Frequency Selector, Sensitivity, and Intensity knobs control the tonality and response of the pedal with an output Vol knob to match or boost your signal. A dedicated Up/Down foot-switch lets you change the direction of the filter sweep. And it can sound seriously massive with bass heavy audio content. But the coolest part of the Deep Animation is the Trig (Trigger) input jack. Similar to how you’d use sidechain compression or gating, the Trig input lets you use an external sound source to trigger the effect. You could use a kick from a drum machine, maybe another band member’s instrument, or even your own signal from earlier in your signal chain. Envelope filters typically respond best to your clean guitar signal, but you can get some cool sounds by filtering later in your audio path, particularly after distortion. If you were to split to your guitar signal to feed the Trig input while simultaneously running it into a gnarly distortion pedal before it hits the Deep Animation’s main Input, you could achieve the absolute tightest auto-filtering of a distorted/effected guitar signal. Some seriously cool possibilities await to be discovered with this pedal. Crazy Tube Circuits had a lot of cool new pedals on display, but the Echotopia was the biggest standout showing for me. It’s a tape echo style delay with 4 heads, each with their own individual panning knob for discreet placement across the stereo field. The Crazy Tube Circuits booth had the Echotopia feeding two amps spread apart, and the stereo image created by this pedal was inspiring to behold. Thankfully, the Echotopia also has tap tempo and 3 selectable tap divisions for easily setting a precise tempo for the 4 synchronized delay heads. Modulation is present with dedicated Rate & Depth controls. A Mood knob further augments the delay sound, and the Tap foot-switch can be pressed to induce oscillating repeats. An expression pedal can control either the delay mix or Feedback. The Echotopia can be run in mono, but it looks like more of an enticing consideration for guitarists who run a stereo rig. Totally Wycked Audio had several prototypes of promising new pedals at NAMM, but the Mini Morph was surprisingly my favorite. It’s actually a shrunken down version of the TWA Dynamorph, so you can look up that pedal to get a better feel for what the Mini Morph is all about. Essentially, it’s a fuzz that responds to your playing dynamics to alter the tonality and harmonic content of the distortion while you play. It’s particularly noticeable when chords are ringing out and during your initial pick attach as an audible sweep of frequency articulation can be heard. The Mini Morph is simply fun to play and warrants a closer look if you’re looking for some fuzz tones that have a unique flavor. While not really an effect (unless you count the preamp boosts), the Ohmless Pedals Multitool is a junction box utility pedal that provides several vital functions for performing guitarists. The Multitool has 2 inputs, each with a switchable preamp boost providing up to 25dB of clean headroom. This comes in handy for matching signals when switching between guitars with differing output levels or for running hotter signals. On the right side is a passive Send & Return with optional buffer. This is useful for things like compressors (buffered) or fuzz pedals (unbuffered) that you want to be shared between both guitars. Then there’s an OpAmp buffer with a separate Tuner Out followed by another Send with Stereo Returns. This is where you’d put the rest of your effects. There’s also an optional Phase inversion switch on the Right output and a Ground Lift on the isolated Left output. The Outputs each have their own dedicated Mute switches and can be summed from Stereo to Dual Mono. The Multitool is one of the most versatile compact junction boxes, and there’s also a version for switching between acoustic and electric guitars if that’s what you need. This list doesn’t encompass all of the great pedals shown at NAMM, and this has been the most difficult list to curate since I started covering the pedals of NAMM several years ago. Still, I feel confident in the assessment of these being the standout pedals of the show. Many other builders are doing great things, so do your best to consider all factors when buying new gear and not just the hype and excitement surrounding a few pedals. If you’re in a band, hopefully some of these pedals can help invigorate your music with new sounds. If you’re a hobbyist, that’s great, too, but maybe consider recording some of those awesome sounds you’re making in your bedroom and showcasing them on YouTube, Instagram, or elsewhere. The main goal of this article is to inspire you. If something you found here does that, find a way to share that inspiration with others. What about the new ZVEX Fuzz Factory silicon version? You missed the Lamp Electric Sh!t Box @LampElectric it blew me away. It blew away the guys from Reverb as well. Look out for it really soon being featured by Reverb. Sh!t about to go down! Pun intended.